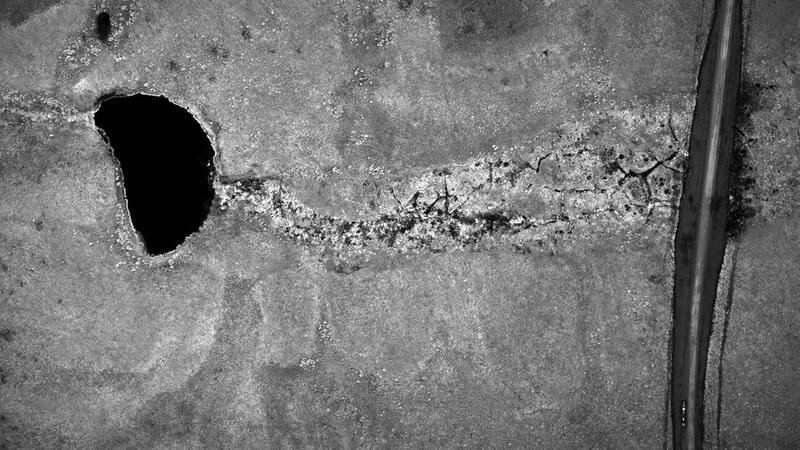 The image was acquired during a flight near the Inuvik region, northwestern Canada. It has a resolution of less than 10 centimetres. The image was acquired during a flight near the Inuvik region, northwestern Canada. It is the same scene as in the previous colour image and has a resolution of 15 centimetres. The DLR engineers tested the MACS polar aerial camera, which they had developed and built, by deploying it north of the Arctic Circle. On this mission, they conducted optical remote sensing from the air for the very first time in the Arctic. Changes to the permafrost soil were measured to better understand the effects of global warming, as large amounts of the greenhouse gas methane are stored within it and are increasingly being released. The camera developed by the DLR Institute of Optical Sensor Systems provided high-resolution images in the visible and near-infrared ranges. 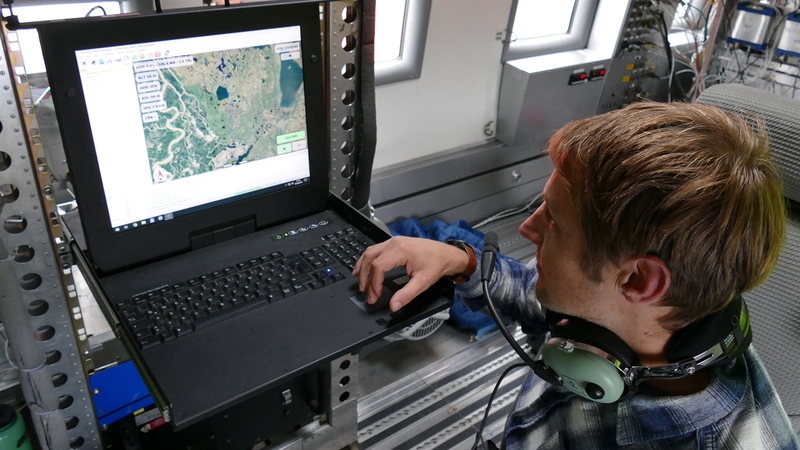 In August 2018, the modular aerial camera system (MACS) developed by the German Aerospace Center (DLR) charted the region around Inuvik, Canada, on board the polar research aircraft POLAR 5, operated by the Alfred Wegener Institute for Polar and Maritime Research (AWI). The measurement campaign being conducted by the AWI seeks to investigate and acquire a better understanding of climate processes in the Arctic. The polar research aircraft POLAR 5 of the Alfred Wegener Institute for Polar and Maritime Research (AWI) is equipped for flights under the extreme environmental conditions of the polar regions. The aricraft can take off and land on concrete, gravel and snowbound surfaces using a combined ski- and wheel-fitted undercarriage. De-icing systems, heating mats for batteries and engines, and advanced navigation systems allow it to carry out missions in very difficult weather conditions and at temperatures as low as –54 degrees Celsius. In August 2018, the German Aerospace Center (DLR) installed a modular aerial camera system (MACS) for optical remote sensing on board the aircraft. To get a better understanding of climate processes in the Arctic, scientists from DLR, AWI and GFZ investigate and acquire images of the region. DLR supports the campaign with the MACS polar aerial camera, providing high-resolution images in the visible and near-infrared ranges. The operating conditions might be unconventional, and the means of transport is certainly far from common, but a modular aerial camera system (MACS) developed by the German Aerospace Center (Deutsches Zentrum für Luft- und Raumfahrt; DLR) has been installed on board the POLAR 5 research aircraft of the Alfred Wegener Institute for Polar and Marine Research (AWI). Its purpose is to acquire images of the Inuvik region in Canada. The measurement campaign being conducted by the AWI seeks to investigate and acquire a better understanding of climate processes in the Arctic. 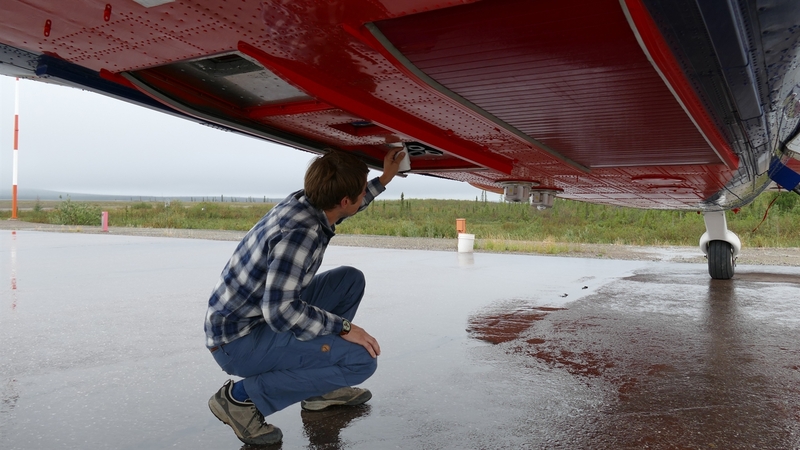 The DLR engineers and scientists are making the most of this mission north of the Arctic Circle to test the MACS polar aerial camera that they have developed and built. "We are delighted to be able to use this camera for the first time to carry out remote sensing in the Arctic," says Project Manager Jörg Brauchle from the DLR Institute of Optical Sensor Systems. Changes to the permafrost soil are being measured to better understand the effects of global warming, as large amounts of the greenhouse gas methane are stored within it and are increasingly being released. As part of this field research, scientists from three Helmholtz institutes – the German Research Centre for Geosciences (GFZ) in Potsdam, AWI and DLR – are conducting measurements with a wide range of different sensors. The camera, developed by the DLR Institute of Optical Sensor Systems, is providing high-resolution images in the visible and near-infrared ranges. The coastal erosion, which is advancing as the permafrost soil thaws out, will also be recorded with the aerial camera. So far, this has been done exclusively using a laser-based system. This lidar (light detection and ranging) system captures two to four measuring points per square metre on flights at an altitude of one kilometre. "Optical systems like our MACS camera, on the other hand, map 120 points per square metre when flying at the same altitude," Brauchle says. This resolution makes it possible to depict 3D structures in much more detail, and thus identify changes to the surface with far greater accuracy. In addition, automatic distinctions between water surfaces and tundra soil are drawn much more easily with the optical sensors. 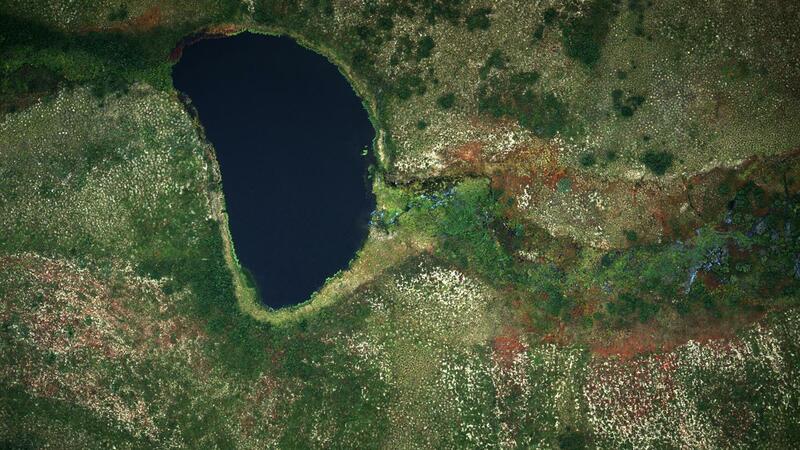 "The different types of soil, vegetation coverage and expanses of water can be easily distinguished in our images," explains Matthias Geßner, a scientist at the DLR Institute of Optical Sensor Systems. Besides the classification of the terrain, one of the main tasks of the MACS camera is to create a high-precision three-dimensional reference model that can be used to compare and validate the data from the mission's other instruments. Aerial and ground measurements are being carried out alongside the simultaneous recording of satellite data as part of a further investigation. Scientists from AWI, the University of Würzburg in Germany and Carleton University in Canada are aiming to establish correlations between changes to the surface perceived using satellite data – for instance, the composition of vegetation – and changes to the upper layer of the soil, such as the depth of the thaw layer in summer. As this is taking place across vast regions with a low population density, the use of remote sensing data is playing an important role in environmental monitoring. Aerial camera systems developed by the DLR Institute of Optical Sensor Systems have already been used in a wide variety of missions – from security tasks to remote sensing. For example, MACS data was used in 2015, in cooperation with the Center for Satellite-Based Crisis Information (ZKI), to support emergency services following the devastating earthquake in Kathmandu. MACS cameras have also been installed on jets, helicopters and gliders in order to conduct the 3D mapping of challenging areas and the real-time monitoring of maritime environments. One MACS camera was even flown over the Earth's surface at an altitude of more than 9000 kilometres to provide data for mapping Mount Everest and the nearby Khumbu Glacier in 2014. If the MACS camera proves to be such a success on the flights over Canada, it will be re-deployed for measuring campaigns over Greenland or Svalbard in the coming year. If this goes ahead, the camera developed by DLR scientists will no longer be looking at tundra and tarns, but instead will be capturing and mapping snow-covered expanses and glaciers.